Set in the heart of Shreveport, this Gilbert Drive home is striking and unforgettable. 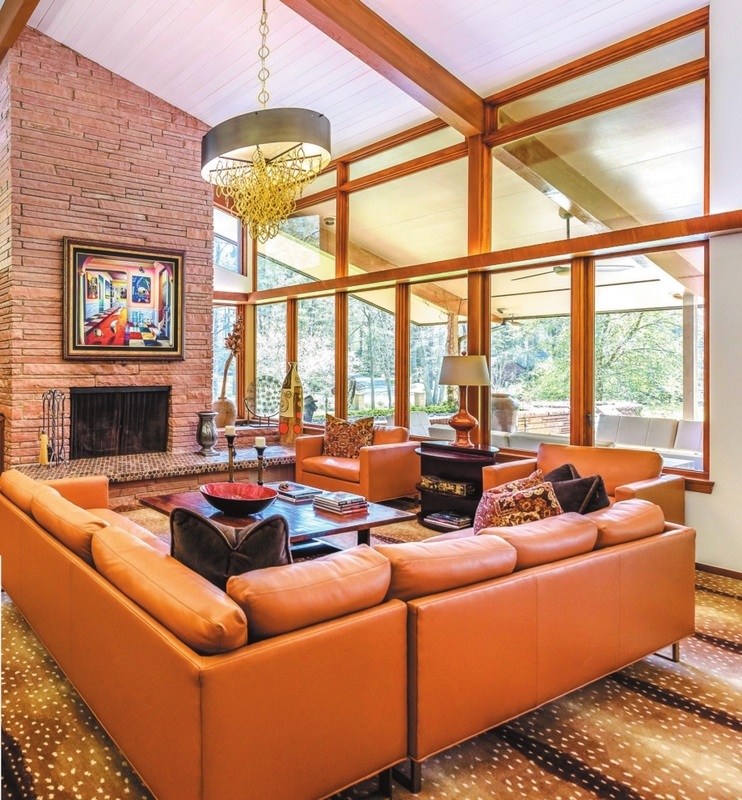 Built in 1953, this midcentury, modernstyle gem stuns with inspiring architecture and 2.27 acres of lush, green grounds. 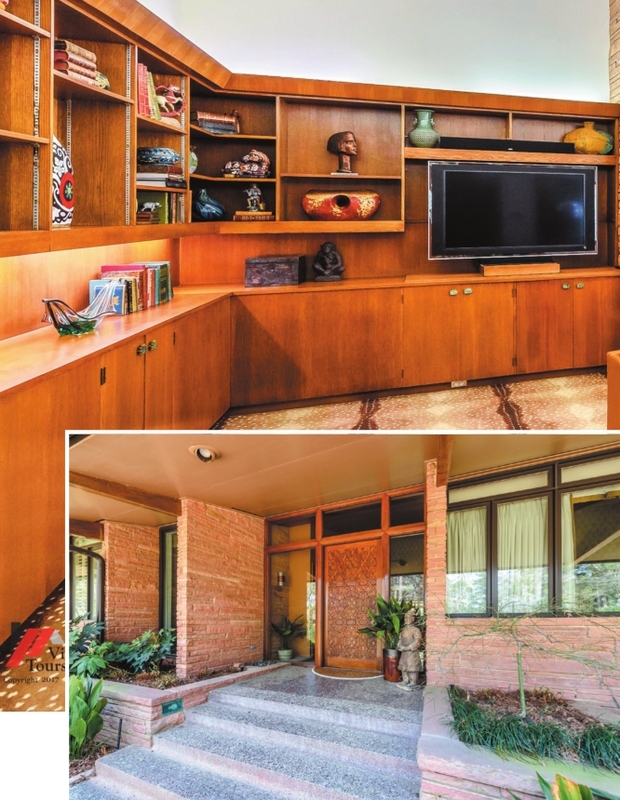 Midcentury modern homes were built from 1945 to the 1980s. The architecture is simplicity defined by large windows, geometric lines, open spaces, elevation changes and integration with nature. The sprawling terrain is surrounded by iron fencing and a gated entrance. A circular driveway leads the way to the nearly 6,200-square-foot home. 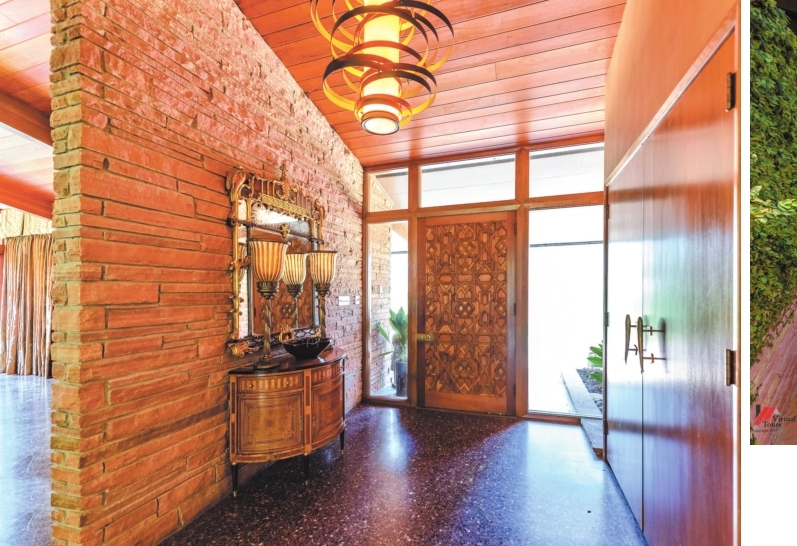 The front entrance is marked by a substantial and beautifully carved wooden door that opens into a foyer. Light spills into the entry through windows that flank the front door. Unique features of the foyer include a vaulted ceiling, stone wall and terrazzo floors. The current homeowners have made several updates to the home – including new windows, LED light fixtures and flooring – while leaving the original structure untouched. The lot was cleared of overgrowth and numerous trees to reach its current manicured appearance. The terrazzo floors continue into the of the foyer. A floating granite counter, its fluid shape reminiscent of lapping waves, serves a dual purpose as art and a buffet. The vaulted ceiling is wood paneled and has wood beams. The room overlooks a tranquil, redesigned courtyard garden. The soothing outdoor space showcases a bubbling water feature and koi pond and has a flagstone path. Back in the entry hall, wood floors lead to the kitchen, a wet bar, family room and sun/garden room. The sleek gourmet formal dining room, which lies to the right kitchen has new bentwood cabinetry and an abundance of storage, a Sub- Zero refrigerator/freezer, and a Wolf gas range, vent hood and warming drawer. A large island topped with a leathered Absolute Black granite countertop also serves as a breakfast bar. The work was done by Kitchen & Bath Cottage. A trio of Restoration Hardware industrial-style pendant light fixtures hang above. The remainder of the kitchen features stainless steel counters and backsplash with undercabinet lighting. There is a Miele built-in coffee machine for the java aficionado. 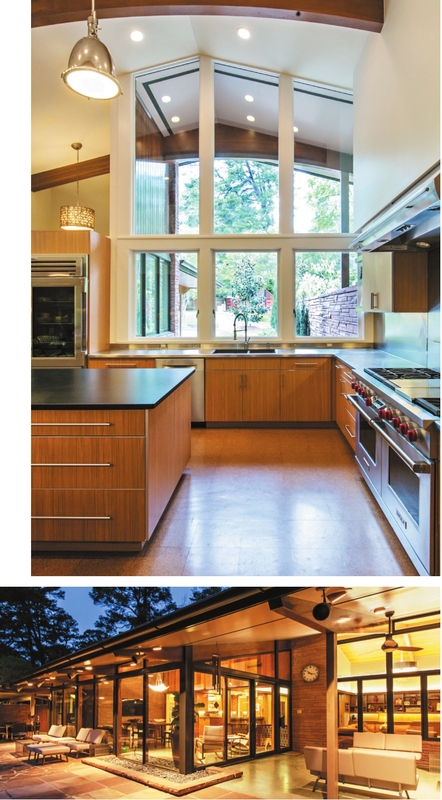 The windows above the kitchen sink overlook the grounds. A wet bar can be accessed from the kitchen and was recently updated with granite countertops. The spacious utility room off of the kitchen features more cabinetry and a sink. Nearby lies a powder room with a beaded ceiling and new vanity with a granite countertop. 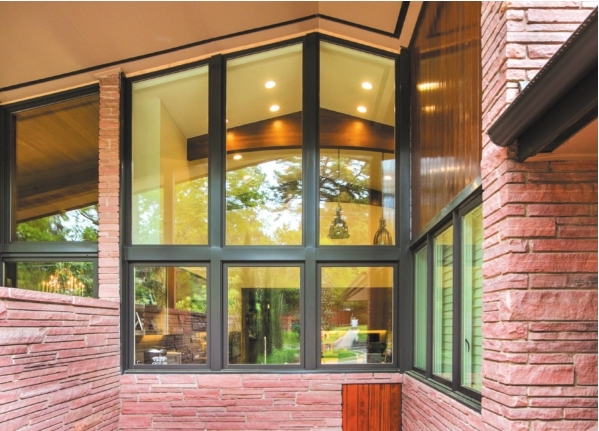 The sun/garden room has a vaulted wood-paneled ceiling, terrazzo flooring, a stone accent wall and a bank of new fulllength windows that offer unhindered views of the outdoors. In fact, all of the windows in the home have been recently replaced with Marvin windows from the Kitchen & Bath Cottage. The furnishings and lighting were purchased in Florida. The homeowners did the interior design of the home themselves, picking up pieces here and there that caught their eye. The end result is that each room has its own unique personality. 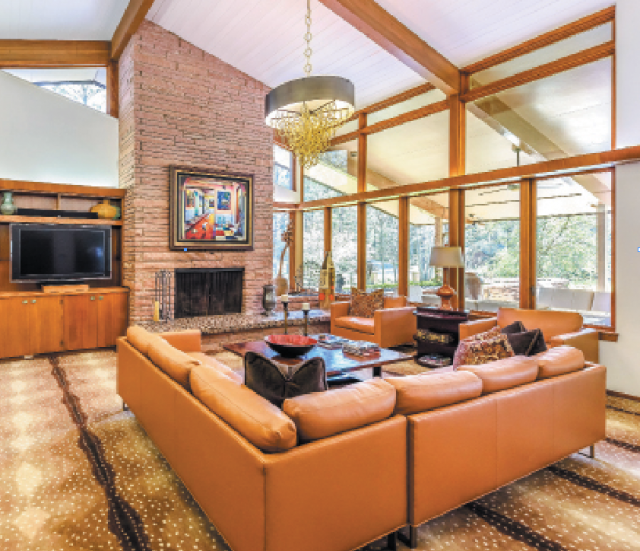 The living room has a beamed vaulted ceiling, stone fireplace and a wall of built-in cabinetry. The sectional sofa is a Restoration Hardware find. The covered terrace off of the room is a comfortable space to enjoy the outdoors and has a vaulted ceiling and terrazzo flooring. Two of the home’s four bedrooms are located on the upper level. The upstairs guest room has a vaulted beaded ceiling, carpeting and custom shutters. The private bath is so large it could be mistaken for the master bath! 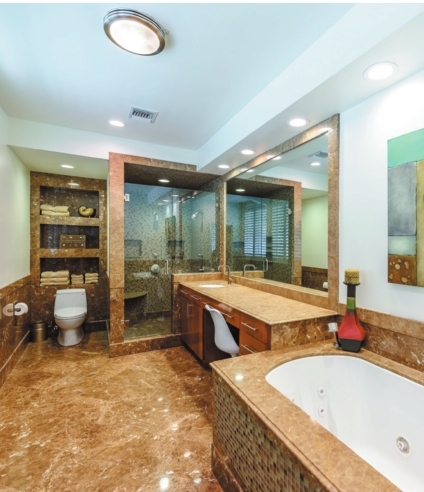 It has a jetted tub, granite counter, large shower stall and heated marble floors. The home has a total of four and a half baths. All of the bathrooms have been completely remodeled. The expansive master suite is a cozy haven with a vaulted ceiling, sitting area and large windows overlooking the grounds. The en suite bath features his and hers sides with a walk-through shower, marble counters and heated marble floors. The “her” side also has a vanity area and built-ins for storage. A study is also located upstairs. It has a beaded vaulted ceiling, wood flooring and custom shutters. Stairs lead down to the home’s lower level with two more bedrooms connected by a Jack and Jill bath, an exercise room that was formerly a craft room, and a den that opens onto an outdoor terrace. The first bedroom has slate tile floors, a soothing neutral palette, and is furnished in Florida style. The homeowners purchased many of the furnishings while living there. The Jack and Jill bath has an immense walk-in shower with a bench and frameless glass door, double sinks set in granite counters, a tile backsplash and heated marble floors. The second lower bedroom has carpeting, custom shutters and a world traveler vibe. The furnishings in this room were found in Dallas. The den has built-ins, a fireplace, and opens onto another outdoor terrace. The home is located at 7130 Gilbert Drive and is currently for sale through Coldwell Banker Gosslee.